FORT WORTH — One week before a grand jury in liberal Travis County indicted Gov. Rick Perry on two felony counts, he and U.S. Sen. Ted Cruz were in friendlier territory, speaking at a conference hosted by a conservative blog here in the largest reliably Republican community in Texas. Perry walked onto the stage of the RedState Gathering to warm applause, his regard among conservative activists having been bolstered by his recent activity related to the border, particularly his decision to send National Guard troops there in response to an influx of migrants. “If Washington won’t act to secure the border, as governor of Texas, I will,” Perry said. Eight hours later, Cruz walked into the same hotel ballroom, greeted with the kind of rapturous cheers fitting a military commander returning home from a combat victory. Perry’s presidential ambitions have since been overshadowed by the news Friday of his indictment related to a 2013 veto of funding for the state’s anti-corruption prosecutors. Travis County District Attorney Rosemary Lehmberg, who oversees the public integrity unit, refused Perry’s calls to resign after she pleaded guilty to drunken driving, prompting the governor’s veto. Perry was indicted on counts of abuse of official capacity and coercion of a public servant. Perry's office has said he has only acted within his authority as governor. "The facts of this case conclude that the governor's veto was lawful, appropriate and well within the authority of the office of the governor," David L. Botsford, counsel for Perry, said in a statement. He added that Friday's action was "nothing more than an effort to weaken the constitutional authority granted to the office of Texas governor." Cruz released a statement Saturday dismissing the charges against Perry as trumped up. "Unfortunately, there has been a sad history of the Travis County District Attorney's Office engaging in politically-motivated prosecutions, and this latest indictment of the governor is extremely questionable," Cruz said. "Rick Perry is a friend, he's a man of integrity – I am proud to stand with Rick Perry. The Texas Constitution gives the governor the power to veto legislation, and a criminal indictment predicated on the exercise of his constitutional authority is, on its face, highly suspect." Even before his recent legal troubles, Perry was already operating in Cruz’s shadow, as most conservative activists in attendance made clear they would rather see the freshman senator vie for the White House in two years than the three-term governor. “When I look at you, I imagine you would be just like one of the founding fathers of this country,” a female attendee told Cruz after his speech. The dynamic underscored a growing tension in Texas politics. As the state’s two highest-profile Republicans are contemplating bids for the White House, Cruz and Perry are at the start of a period where they are likely to be constantly jockeying for favor among the same audiences. The legal troubles that have surfaced for Perry could scuttle his hopes of running again for president before they gain traction. “This will — depending on how it plays out and how long it lasts — will certainly be detrimental to that nascent campaign for the presidential nomination in 2016,” said Cal Jillson, a political science professor at Southern Methodist University said. While Cruz is vying for the favor of Tea Party voters, Perry could still be a powerful draw to a segment of conservatives more interested in a candidate with executive experience, Jillson said. In Cruz’s speech, he promoted recent conservative victories in Washington, including the Democrats’ failure to pass gun control legislation after the mass shooting at an elementary school in Newtown, Conn., as signs of a shift in the relationship between grass-roots conservatives and elected officials. Perry’s speech was reminiscent of ones he gave during his 2012 bid for president in the way it focused on the robust Texas economy, and his belief that the federal government should follow the lead of Texas and other conservative states by lowering taxes and balancing budgets. Bob Guzzardi, a conservative activist from Ardmore, Penn., told Perry after his speech that he hoped a man with his message would run for president. Asked about it a day later, Guzzardi stopped short of saying he would support Perry in a second presidential run. “I liked the emphasis of what he is talking about, but frankly, I’m more of a Ted Cruz guy,” Guzzardi said. Kathleen Wazny of Denton echoed a similar sentiment, praising Perry’s record and noticing an improvement in his delivery from his first presidential run. Yet there was no question whom she hopes to support in 2016. As Jeff Tucker of Round Rock and Michael Pemberton of Radcliff, Ky., poured themselves cups of coffee ahead of another day of RedState panel discussions and speeches, they compared impressions of the day before. Pemberton described Perry as more passionate but said that Cruz’s arguments were sharper. “I think of the two of them, together, they make one great politician,” Pemberton said. 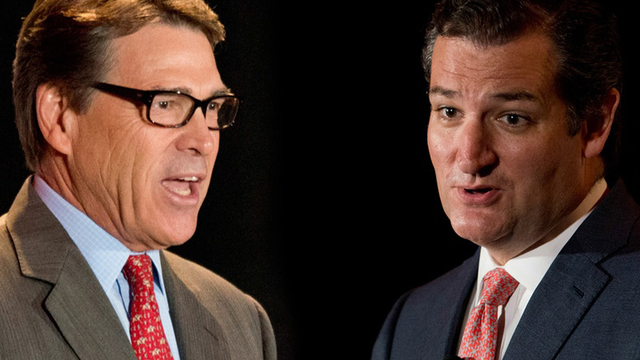 He then wondered aloud: Could the two Texas leaders possibly run on the same ticket? “I’ve thought a lot about that,” Tucker admitted. But who should be at the top of the ticket? The two men considered the question for a moment. Disclosure: Southern Methodist University is a corporate sponsor of The Texas Tribune. A complete list of Texas Tribune donors and sponsors can be viewed here.